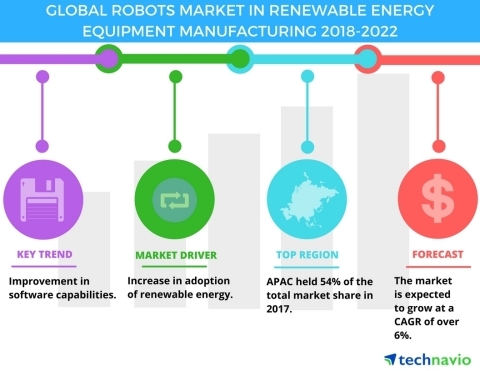 LONDON--(BUSINESS WIRE)--The global robots market in renewable energy equipment manufacturing is expected to grow at a CAGR of over 6% during the period 2018-2022, according to a new market research study by Technavio. The report presents a comprehensive research of the global robots market in renewable energy equipment manufacturing by application (material handling, welding, and soldering, assembly, dispensing, and others), and by type of robots (articulated robots, cartesian robots, SCARA robots, and delta/parallel robots). The report also determines the geographic breakdown of the market in terms of detailed analysis and impact, which includes key geographies such as APAC, the Americas, and EMEA. With increased focus on sustainability and environmental conservation, the forecast period will see an increase in the impetus on green energy initiatives such as solar PV, wind power, geothermal power, biopower, and hydroelectric energy. Major global level initiatives to reduce the carbon footprint and promote climate change, such as the Paris Agreement and the UN General Assembly's Sustainable Development Goals on Sustainable Energy for All (SDG 7) initiative, launched in the year 2015, promote the use of renewable energy with the aim to reduce greenhouse gas (GHG) emissions. Vendors are developing simulation software for programming robots that include features to make programming hassle-free. Vendors also offer software packages for programming applications that control domain-specific tasks such as handling, welding, and assembly line along with superior tasks such as the coordination of multiple robots. The forecast period will witness an increase in the adoption of software to assist end-users in modifying and scaling-up the production of renewable energy equipment manufacturing. Simulation ensures that the system design can accommodate production needs, with minimal increase in capital costs. The improvement in software facilities is expected to positively impact the growth of the global robots market in renewable energy equipment manufacturing. In terms of geography, EMEA is the second largest revenue contributor to the market, with a share of over 26% in 2017. However, vendors face major challenges in Europe since the market is fragmented, and it is essential for vendors to adapt their offerings according to country-specific regulations. The global robots market in renewable energy equipment manufacturing is expected to grow at a CAGR of over 6% during the period 2018-2022.